You can also check out all our Spanish vocabulary games grouped by theme. Ahora estás escribiendo la l de lobo. Esa es l de limón. Esa l es de linda, como tú. Y esa, es la l de león. ¡La borraste! Oh no…¿Qué pasó con la l de león? As you can imagine, the león had run away, but came back. Soon my playmate was writing an l and saying ¡Adivina!, which meant list words that start with l until you hit on one I like. I listed words, until she finished the plana. Then, I went home and applied the idea to this simple game. I call this Spanish guessing game A de avión. Players look at a letter on the back of a card. The letter is the first letter of the picture on the card. Players guess what word the letter represents. If they are correct, they keep the card. If not, they return the card to the table. Depending on the age of the players, they can rearrange the cards as they return it. 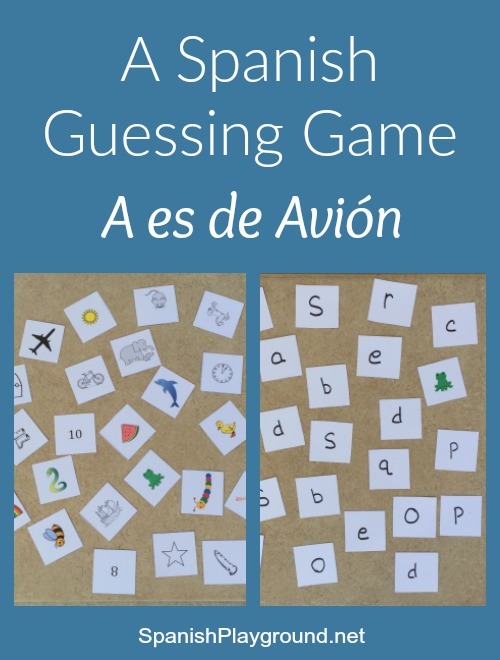 This Spanish guessing game can be played with any picture cards. You need one of each picture. There are links to printable pictures cards below. You can use any number of letters and cards per letter. Adjust for the age of your players. It is more fun if there are at least two cards for each letter you are using. Write the initial letter of the word on the back of the card. Before you begin, place the cards face up and say the words aloud. As you do this, you may want group them by initial letter sounds, depending on the level of your students and how familiar the vocabulary is. Turn the cards face down and move them around. The object is to guess the picture on the card by remembering the position and using the letter as a clue. You can play that when you guess correctly, you get to guess again. This makes the game go faster. The person with the most cards wins. This is a great game for re-entering vocabulary from previous themes. You can also play this game writing the words on the cards instead of pictures. This works well with older students and vocabulary related to a theme. You can find lots of printable picture cards on Spanish Playground. This set of alphabet picture cards has 3 pictures for each letter and works well for this Spanish guessing game. This set of rhyming cards also has several pictures for the letters A, B, C, G, L, M, N, P, R, S, and V.
If you’re not sure of how to say the letters in Spanish, this video from TakeLessons is a useful reference. Adapt this Spanish guessing game according to ages and levels. Let kids make new rules and make the simple game their own. Most important, have fun! You may also be interested in this printable game to teach animals, places and verbs. It is based on Go Fish.